So far, 2008 has been off to a very hectic start. I guess partying to usher in the new year is an indication of how the year would be like. To top it off, two months into 2008 and I’ve already consumed more alcohol than I ever did the whole of 2007. I’m so looking forward to the coming months. Adding fuel (or alcohol) to this streak is Delifrance’s latest line of “naughty” drinks: spiked coffee! Getting sloshed is a nice way to start an event. There are three spiked coffee variants: Irish Kiss Baileys, a heady mix of rich espresso with Irish cream, served in a wine glass with lemon sugar lining the rim; Mayan Passion Kahlua, an exotic mix of espresso, Kahlua and whipped cream served either hot or iced, and; Sputnik Vodka Espresso, a drink, according to Delifrance President Mr. William Tan Unitong, that will send you to the skies with its intense combination of espresso and vodka. Spikedafter5.com recommends some of Delifrance’s bestsellers to go with the spiked coffee of your choice. 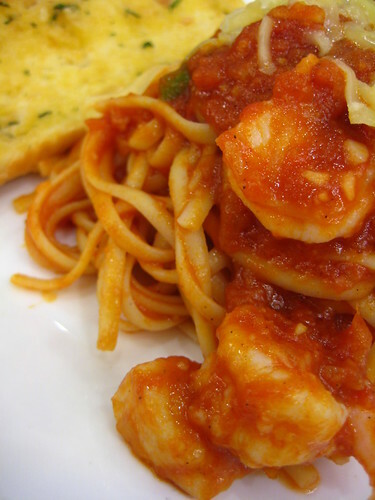 If you’re looking for a hearty meal after a long day at the office, they recommend the Seafood Marinara Pasta with its juicy shrimp, rich marinara sauce over linguine pasta. As a light snack, the Half Premiere Clubhouse is the perfect mix of meat, veggies and freshly baked bread. The Baguette Chips and Dip would do well for sharing with friends; golden brown baguette chips served with egg mayo, tuna onion or pimiento cheese dip. As a treat after a long day (or week), indulge yourself with the Flaming Choco Lava Cake, a very rich absolutely heavenly dessert. The food was good and the coffee, even better. I really loved the Oriental Shrimp Salad: fresh greens tossed with mixed seafood and yummy vinaigrette. 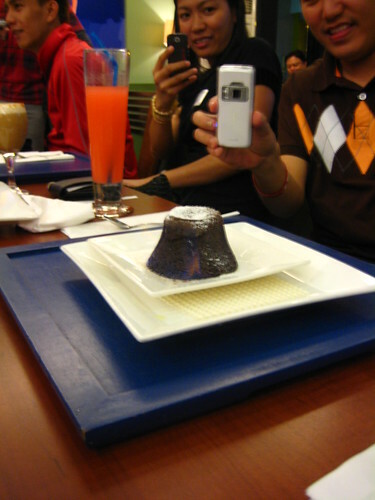 The Flaming Choco Lava Cake was the crowd favorite, not just because of its rich flavor but also because of the flame. Everytime a waiter comes to deliver a cake, everyone would gather around him to take a photo. As for the spiked coffee… well, I liked them all! Kahlua: Yum. Bailey’s: Yumm. Vodka: Yummmmmmmmm. Oh, and the espresso’s good, too. 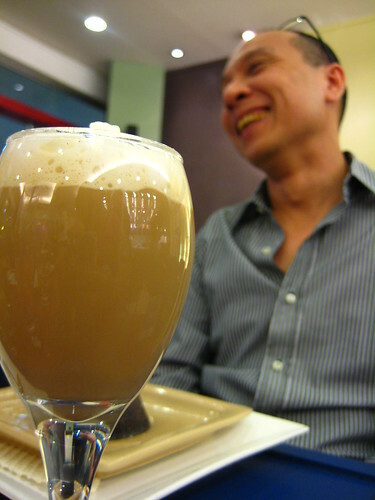 Get a taste of Delifrance’s naughty coffee from March 3 – 7 between 5 – 7 pm at participating Delifrance branches. When asked by a Delifrance barista for the password, say “naughty with my coffee” and get a cup of spiked coffee for free! Participating braches includes Greenbelt 1, ZETA, RCBC Plaza, Valero, Insular Life, Towe 1, AIM and SM Makati in Makati city; Robinson’s Place Manila and UN Avenue in Manila city; Alabang Town Center and Festival Supermall in Muntinlupa city; Roosevelt and Greenhills Theater Mall in San Juan; Libis, St. Lukes and Philippine Heart Centre in Quezon city; The Podium in Pasig city, and; Mall of Asia in Pasay city. Great to see you, Nina. Love your pics, esp. the angle from where you took Mr. Tan Untiong’s pic. Is that care of the nifty Gorillapod? Sputnik Vodka Espresso? That sounds more toxic and mind-blowing than a Pan-galactic Gargleblaster! Wow! This looks fantastic! FREE DRINKS! Hooray! Thanks! Pusa: It really is a must try! And they must have the freshest seafood pasta in Manila.. the shrimp were so juicy! Ajay: Yup! I think I may have used my Gorillapod for this shot. Speaking of Gorillapods… Cebu Pacific is selling Gorillapods for only Php180! Shocking no? TripTheLady: It was! It was so juicy and so fresh. A definite must-try! hey nandun ka din pala! i didn’t even get the chance to thank you. your australia posts helped me a lot. i finally have a ticket! going there in May! yey! Hi Rick! Hehe, I hardly mingled during that event, so it’s not surprising we didn’t get to talk ^_^; Where in Australia are you going? hi! my mom was the current manager in valero when those products were introduced! but now she’s resigned.. just want to thank delifrance for their help ! ^^ have a nice day and have a fine dining at delifrance! to what i said above, i want to thank them for helping my mom have a great experience and great opportunity to what she have right now and not to why she resigned.. hehe .. have a nice day guys!